In the modern India there was born a hero who was desperate to fight against the British Raj and his leadership qualities were so intensive that attracted people without a second thought. Let’s meet one of the greatest heroes of Modern India. Birsa was born at Bamba in a suburb of Ranchi (Now Jharkhand) on 15th November, 1875. The son of a poor parents Sugna Munda and Karmi Hatu, he grew up around the forests of Bohonda, grazing sheep and dancing in the akhara. When he grew up, he had an interest in playing the flute, in which he became expert. He went round with the tuila, the one-stringed instrument made from the pumpkin, in the hand and the flute strung to his waist. Forced by poverty, his father had to move from place to place looking for work. Driven by poverty, Birsa was taken to Ayubhatu, his maternal uncle’s village. At Ayubhatu, Birsa lived for two years. He went to school at Salga, run by one Jaipal Nag. He came in contact with a pracharak who visited a few families in the village which had been converted to Christianity and attacked the old Munda order. As he was sharp in studies, Jaipal Nag recommended him to join German Mission School but, converting to Christianity was compulsory to join the school and Birsa was thus converted as a Christian and renamed as Birsa David, which later became as Birsa Daud. One day the class was going as usual in the German Mission School, at Burj, Chaibasa. A Christian teacher Dr Nottrott repeatedly uttered derogatory words for the Mundas. Birsa left the school in protest. He criticized Dr. Nottrott and the missionaries in razor-sharp words. They refused to have him in their school any longer, and he was expelled. This was a turning point in his life; he exclaimed saheb, saheb ek topi hai (all whites, the British and the missionaries, wear the same cap). It was also likely that the Sardars might have influenced Sugana Munda in withdrawing his son from the school. The sardar agitation in which Birsa was thus caught up put the stamp of its anti-missionary and anti-Government character on his mind. Soon after leaving Chaibasa, Birsa and his family gave up their membership of the German mission in line with the Sardar’s movement against it. As an adolescent, Birsa heard tales of the Munda uprisings (ulgulaan) of the past and saw the Sardars (leaders) of the community urging the people to revolt. They talked of a golden age when the Mundas had been free of the oppression of dikus, and said there would be a time when the ancestral right of the community would be restored. They saw themselves as the descendants of the original settlers of the region, fighting for their land, reminding people of the need to win back their kingdom. Instead of improving his life, He realized that his culture was destroyed and their life style came down. Because thousands of Mundas were converted, Birsa was aggrieved and rebelled against Christianity. He denounced Christianity and became Munda again. The colonialist connection of Christianity was a powerful tool of selling Christianity as the religion of the downtrodden. Any connection between the rulers and the missionaries was however indirect. Birsa’s fight against conversion was yet another reason the British were hunting for his head. It was probably in 1890 that he went to Bandgaon where he came in contact and influence of Anand Panre, who was a munshi to Jagmohan Singh, the zamindar of Bandgaon. Panre was well versed into primary form of Vaishnavism (prevailed in the area) and with the Hindu epic-lore, and also enjoyed some reputation and influence. Birsa also met a Vaishnav monk who visited and preached there for two months. There Birsa learnt much about Hindu religious teachings. He also read Ramayan, Mahabharata and other Hindu books. He gave up meat, worshipped tulsi plant, wore the sacred thread and a dhoti dyed in turmeric like a typical Vaishnavite. Eventually he reverted to the religion of his ancestors, starting a new tribal religious cult known as the ‘Birsait‘ cult which laid stress on prayers, faith in God, observance of a code of conduct, abstention from drinks and sacrifices and so on. His movement was aimed at reforming tribal society. He urged the Mundas to give up drinking liquor, clean their village, and stop believing in witchcraft and sorcery. Birsa also wanted people to once again work on their land, settle down and cultivate their fields. Birsa’s claim to be a messenger of God and the founder of a new religion sounded preposterous to the mission. There were also people within his sect, who converted back from Christianity, mostly Sardars. His simple system of offering was directed against the church which levied a tax. And the concept of one God appealed to his people. The stories of Birsa as a healer, a miracle-worker, and a preacher spread, out of all proportion to the facts. 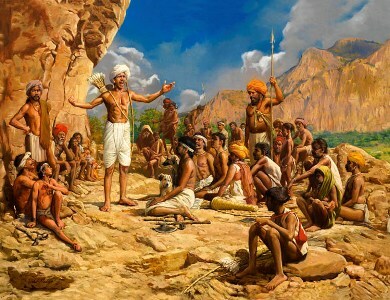 Birsa Munda started to propagate the principles of Hindu religion and advised converted tribal people to peruse their original religious system. Impressed by his teachings, he became a prophet figure to the tribal people and they sought his blessings. Birsa Munda advised the people to worship cow and protested cow slaughter. The Mundas, Oraons, and Kharias flocked to Chalkad to see the new prophet and to be cured of their ills. Soon both the Oraon and Munda population in the entire region became convinced ‘Birsaities’. Contemporary and later folk songs commemorate the tremendous impact of Birsa on his people, their joy and expectations at his advent. The name of Dharti Aba was on everybody’s lips. At that period of history, Mundas were utterly frustrated, disappointed and discontented. They felt that the Zamindars, Moneylenders, Christian missionaries and the British courts, all of them had only one point program and that was to exploit the Mundas. The missionaries lured them to become Christians and the others attacked on their traditional values and socio-economic infrastructure. He left Chalkad in the wake of the mounting Sardar agitation. He participated in the agitation stemming from popular disaffection at the restrictions imposed upon the traditional rights of the Mundas in the protected forest. During 1893-94 all waste lands in villages, the ownership of which were vested in the Government, were constituted into protected forests under the Indian Forest Act VII of 1882. In Chhotanagpur, the forest settlement operations were launched and measures were taken to determine the rights of the forest-dwelling communities. These orders were sometimes not understood by local officers who acted as if all right of forest-dwelling communities had been curtailed. Petitions were submitted claiming the resumption of what they called were their old ancestral right to free fuel, grazing etc. Birsa led a number of raiyats of Sirgida to Chaibasa with a petition for the remission of forest dues. Nothing came of it. The Chotanagpur Protected Forests Rules framed under the Indian Forest Act came into force in July 1894. Viewing Birsa’s involvement in the Sardar agitation with concern, Anand Panre advised him not to let his emotion overpower him; but he would not turn a deaf ear to the inner voice. Thus his three years’ association with the Panres came to an end in 1893-94. To the twin challenges of agrarian breakdown and culture change, Birsa along with the Munda responded through a series of revolts and uprisings under his leadership. The movement sought to assert rights of the Mundas as the real proprietors of the soil, and the expulsion of middlemen and the British. What worried British officials most was the political aim of the Birsa movement, for it wanted to drive out missionaries, moneylenders, landlords and the government and set up a Munda Raj with Birsa at its head. The movement identified all these forces as the cause of the misery the Mundas were suffering. While landlords and moneylenders were taking over their land, and missionaries were ridiculing criticizing their traditional culture. He recruited volunteers to fight the British Government. He called “The reign of the Queen Victoria was over and the Munda Raj had begun. He gave orders to the raiyats to pay no rents, as their lands were free. Mundas were waiting for such messiah. His was not an all-India movement, but it shared with the national freedom struggle. As the movement spread the British officials got panicky. They spread several rumors that on a particular day the non-believers of ‘Birsaites’ from the region are going to be massacred by him and took some people in their good faith by bribing. In the mid night of 24th August 1995, Birsa was arrested while he was asleep. British Govt. convicted him on charges of rioting and he suffered rigorous imprisonment for 2 years in the Hazaribagh Jail. Birsa was released in 1897. He began touring the villages to gather support. As a matter of strategy he went with his followers to Chutia on 28th January 1898, to re-establish the rights and racial links with the temple there. He said that the temple belonged to the Kols in ancient times. The Christian missionaries were unnerved as Birsa had become the biggest stumbling block in their path of conversion. So they were all out to stop and punish him. His followers were arrested. Birsa went underground for two years. During this period he visited Jagannathpur temple. He attended a series of secret meetings and practiced the traditional ritual of throwing arrows on the effigy of Queen Victoria and enemies. By the end of 1899, Dharti Aba the messiah reappeared with magical powers to invigorate his followers, the ‘Birsaites’. Birsa Munda’s longtime companion, a Munda woman Sali was instrumental in organizing the women in this movement. After the suppression of the first rising in 1895, this time Birsa gave a clarion call to the Birsaites of a decisive war against the British. He used traditional symbols and language to rouse people, urging them to destroy “Ravana” (the British) and establish a kingdom under his leadership. After intensive preparations, the Birsaites made a desperate bid to overthrow the British Raj. They raised the white flag as a symbol of Birsa Raj. The Anglican Mission at Murhu and the Roman Catholic Mission, Sarwada was the main target. The Birsaites openly declared that the real enemies were only the Saheb Log (British Officers and Missionary heads) and the Christian Mundas would not be touched. It was January 1900, the entire Munda community was up in arms. During the Revolt of 1899-1900 Birsa emerged as the supreme leader of the Mundas. After a series of concerted attacks for nearly two years on the places loyal to the British, the Munda warriors started congregating on “Dombari Hill” (Nearly 20 Km far from the Ranchi-Jamshedpur Highway), on the call of Birsa. They adopted Guerilla war fare. They attacked police stations and churches and raided the property of moneylenders and zamindars. Several persons, mostly police men were killed and nearly 100 Buildings were set on fire. The revolt rocked the British administration to the extent that the commissioner declared a heavy cash reward for the arrest of Birsa. The then commissioner Mr. A Fobes and Deputy Commissioner Mr. H.C. Streattfield, rushed to Khunti with two company of army to crush the Ulgulan (Total Revolt) for “Abua Disun” (Self rule). Subsequently British forces attacked heavily on Munda warriors congregated at “Dumbari Hill” and made indiscriminate firing like that of “Jaliyan Wala Bagh” and killed several hundred people. The whole hill was littered with dead human corpses. After Brutal slaughter the dead bodies were thrown into the deep gorges and ravines of the hill. Many of the wounded were buried alive. Fear and panic show spread over the area that “Dombari” was named by Mundas as “Topped Buru” – the mound of dead. Birsa somehow escaped. He was treacherously nabbed while asleep at Jamkopai forest in Chakradharpur (Bengal) on 3rd March 1900. The six death, including that of Birsa Munda in the prison during trials in less than 10 months, speaks of the probable tortures inflicted on the prisoners of Ulgulan. 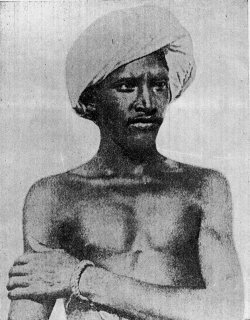 Birsa Munda died in the jail on 9th June 1900. It is said that he was poisoned to death in the jail row. He was not hanged because the British rulers had no guts to execute him publicly. The role of Christian missionaries during the trial of Birsa Munda and his followers was despiteful. Their mouthpiece “Gharbandhu” vomited venoms and published inciting articles in criticizing them. The missionaries also allured the Mundas to accept Christianity or go to gallows. Several Mundas fled from Chotanagpur to Assam, Bengal, Orissa and other places. This was the last of the heroic tribal movements of the 19th century in the Chotanagpur plateau. 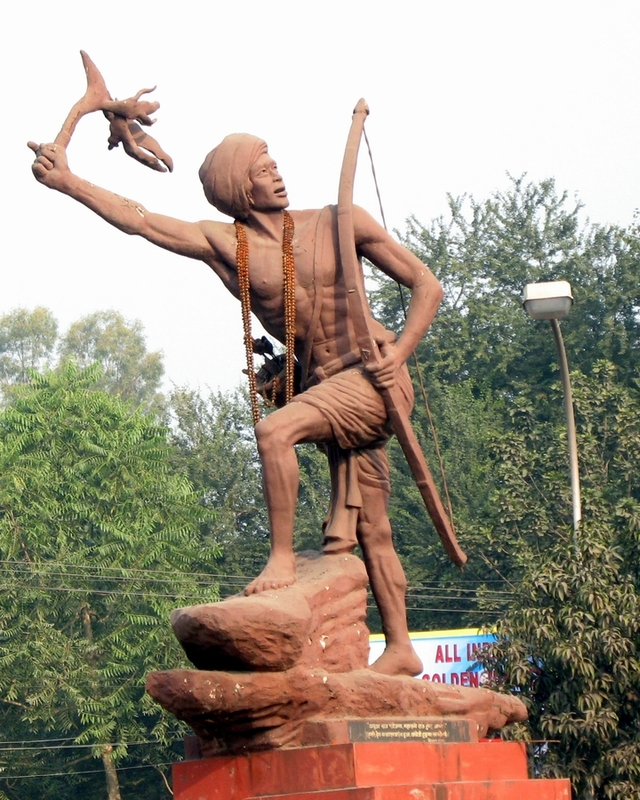 Birsa Munda, the great Dharati Aba shines as the first tribal martyr who fought for the independence of the country. True, he operated in a small area but its impact was felt in the years to come. He was ahead of time. His call against British Raj was Abua Raj ste Jana, Maharani Raj tandu Jana (Let the Kingdom of queen be ended and our Kingdom be established) is remembered even today in tribal areas of Orissa, Madhya Pradesh, West Bengal, Jharkhand and Bihar. Who is a Hindu? What is Hinduism? Kejriwal Vs Najeeb Jung – If there isn’t a crisis, create one ! !